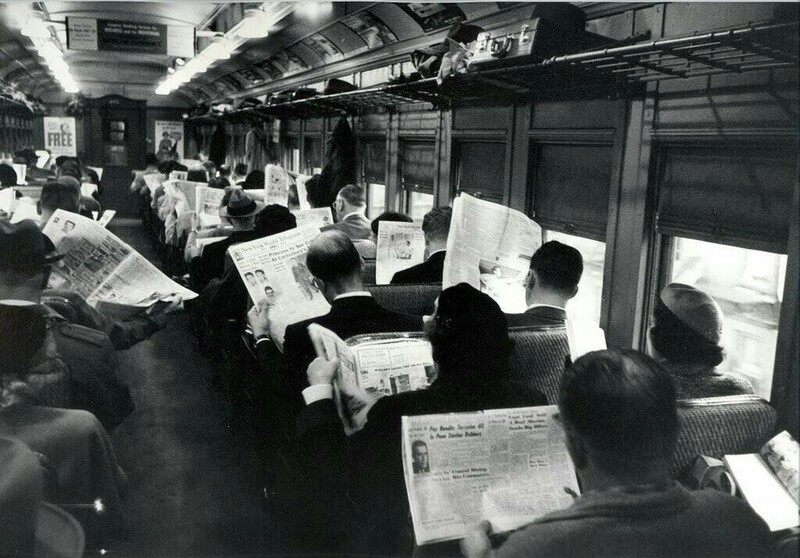 It is not difficult to raise a retrospective cynical notion sighing “Look at all these modern technologies making us anti-social” while looking at this photo, probably taken in the mid-1900s. Someone from the 1800 would be disheartened by this. However, I wager most of us living in the 2000s would acknowledged that it is perfectly okay to read newspapers while commuting. This brings an interesting question: what about using smartphones in these situations now? Many critics of modern technology have raised the concern that our iPhones are taking up so much of our attention in circumstances like dining with families/friends or in daily commute and they make us unsociable. How can we draw the line effectively? Is it okay to listen to music, read ebooks, texting casually, or play games on my phone while commuting alone? Fine with me. Is it okay to do any of them while commuting with friends, but are all tired and are seeking some downtime during journey? Maybe, but mostly yes. Is it okay to do any of them while commuting with friends heading to somewhere else, in a normal or excited state? Absolutely no. Is it okay to do any of them while dining with other people? Absolutely no. Is it okay to do any of them while your wife is sitting besides you on the couch, watching TV shows that you don’t like? Fine with me. I hope you get the idea. See, the important thing here is not the notion of “playing with your phones”, but rather “what you’re actually doing with them” and the social context. The temptation brought by these technology could be so strong that sometimes we stepped overboard without even noticing them. Conscientious personal discipline is required. So far, following the rule has bring me tremendous happiness and the feeling of being “present” while engaging in social activities. More importantly, it also sends a message to your families/friends that they are more important than the things that are happening within the phone at that moment. I encourage you all to do the same. Note: This post is originally published on Medium before posting it here. Posted on May 10, 2014 by chuasoonhau. This entry was tagged smartphone, social etiquette, technology use. Bookmark the permalink.